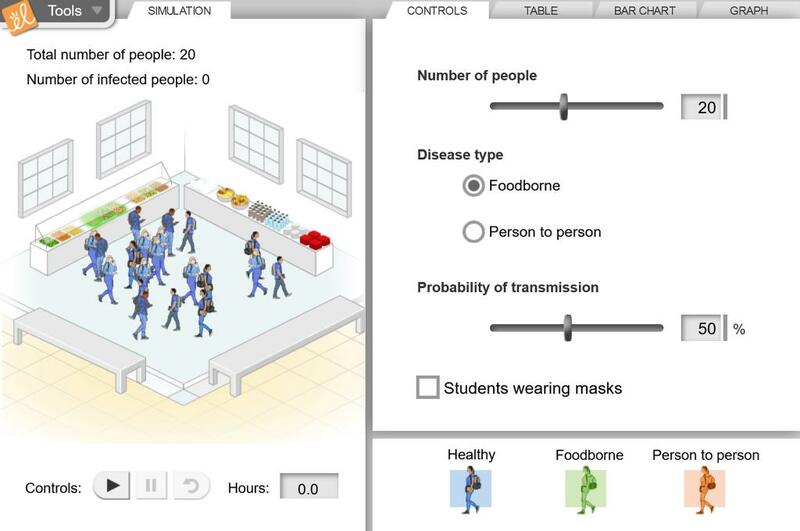 Observe the spread of disease through a group of people. The methods of transmission can be chosen and include person-to-person, airborne, and foodborne as well as any combination thereof. The probability of each form of transmission and number of people in the group can also be adjusted. The student sheet was altered to add rate of infection, adding trials, etc. This worksheet allows students to deepen their understanding of disease spread by investigating the trans... (more)mission of diseases. They state a claim and support it with evidence and reasoning. I have added to the introduction to include the Canadian Listeriosis outbreak in 2008 and changed the bir... (more)d flu reference to H1N1. I have added a 6th item to the guide on foodborne illnesses with a link to the Wikipedia article on the outbreak. Best for biology 11 college preparation as a application assignment and activity.